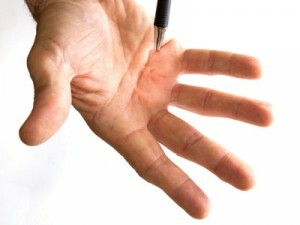 Dupuytren’s disease is a common condition where abnormal scarring appears in the palm of the hand. It starts as a nodule which can be tender and may progress to cords which can prevent the finger from fully straightening, this is termed a contracture. It tends to occur in middle age and is more common in men than women. About half of the patients have a relative with the condition. There may be nodules on the back of the finger knuckles (Garrod’s pads) and lumps on the soles of the (plantar fasciitis). The cause is unknown, but it is likely to have a genetic basis. It is more common in Northern Europe than elsewhere and it often runs in families. Dupuytren’s disease often begins with nodules in the palm, and this is more common in the palm at the base of the ring finger. The disease may extend to form cords in around one third of patients and these may contract to pull the finger towards the palm and prevent it straightening fully. This contracture of fingers is usually slow, taking months or years to develop. It tends to progress more rapidly in younger patients and in those with a close relative with severe disease. There is as yet no cure. Surgery is usually advised to make the fingers straighter, but it may not always lead to full straightening of the finger and it will not eradicate the disease. The operation is carried out under a general or regional anaesthetic and the operation is designed to remove the whole cord (fasciectomy) or segments of it (segmental fasciectomy). With time Dupuytren’s disease may reappear in the operated finger or in other uninvolved digits. If there is recurrence especially where there is advanced disease or where there is marked skin involvement an operation called a dermofasciectomy may be recommended. This involves removing the involved skin and Dupuytren’s disease and resurfacing the finger with a skin graft. This has the lowest rate of recurrence but is a larger procedure and recovery is generally slower than with other surgical treatments. After surgery, the hand is bandaged and as the hand heals a splint is provided to be worn at night; this is usually done at ten days. The help of a hand physiotherapist is important to recover movement and maximise the gains achieved at operation. Most patients who require surgery need only one operation during their lifetime. Published evidence does not support the use of radiotherapy for the treatment of established Dupuytren’s cords. The use of collagenase by direct injection into the contracture cord is a new treatment for Dupuytren’s disease. It acts by dissolving the cord and requires an extension procedure two to three days later under local anaesthetic. Whilst the recurrence rate is a little higher than with surgery it is a much better tolerated and many studies show that it is preferred to surgery by patients. It can be undertaken as an outpatient treatment.